I am the amazing Lizard Rescue Woman! If there is a lizard in distress, I'll be there to save him--provided he is somewhere in the house here. In the past 24 hours, I've rescued three lizards, or perhaps it has been the same one three times. Who knows? These little guys (or one little guy) keep getting in the house, and the cats just have a field day. Socks greeted me this morning with a strange, deep throated meow and a tail hanging out of her mouth. A good smack on the head made her release her prey so that I could gather it up into a jar and put it safely outside. How many times am I going to have to repeat this before the darned lizards get a clue? I promised pictures before the week ended, and you're going to get them today. 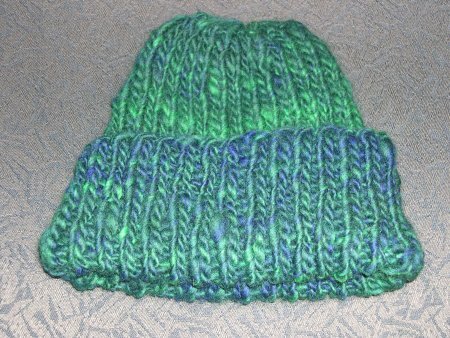 Here's a hat that I made from some of my own handspun yarn. This yarn is a single spun thick on my Lendrum. I started with a batt of Corriedale from Grafton Fibers. I'm pleased with how this turned out, and I do believe it is easily the prettiest thing I've made with my own handspun so far. 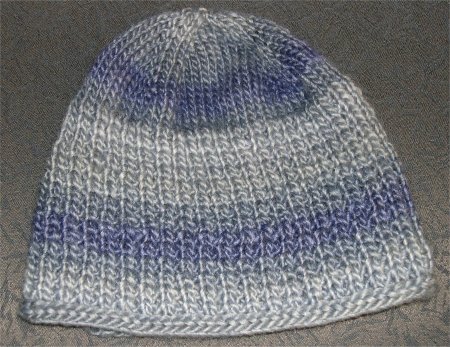 I knit this hat with Patons SWS in color denim. I am loving that i-cord bind off! It just makes the hat, I think. My current project is a top down capelet. The pattern is from a friend (not published) and just uses simple raglan increases. I'm using cheap yarn--Plymouth Encore in an oatmeal color--but surprisingly, it's turning out well. I just really prefer natural fibers to the artificial, being the yarn snob that I am! We have a busy weekend planned. We need to go out and get our Christmas tree which means we'll also need someone *cough* husband *cough* to climb into the attic and retrieve the decorations. Daughter has a paper and a project for school, and she also needs to start preparing for exams which happen in two weeks. We may have someone coming to give us an estimate on closing in our garage and converting it to a rec room.... There's just a lot going on. Of course, I figure that somewhere in there, I'll find time to sit and knit a bit or sit and spin. Wish me luck. Lovely! I love the SWS hat too- was it done via the top down hat calculator? Your yarn looks beautiful knitted up. I know that makes you proud. Wow! I love your handspun hat. Those colors are just gorgeous! There just quite isn't anything like knitting with your own handspun yarn. I-cord makes a lovely edging, even if it does take forever to do. Nice handspun hat! Lovely colors! Top one looks soft as a cloud. What was the pattern fo rthe SWS one? I am LOVING that handspun hat. The colors are gorgeous, and your spinning looks great. Go you!